Magnolia cubensis ssp. acunae is found nowhere else in the world but Cuba. 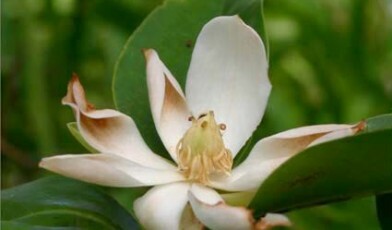 Cuban Magnolias differ from other species of the genus. Unlike their relatives they have three stipules in the petiole and a sessile ovary, making them unique worldwide. This subspecies is extremely rare and is scattered in the montane rainforests of the Guamuhaya range. The tree reaches an elevation of 950 m but does not grow below 700 m. It occurs in less than 15 known localities with just a few individuals remaining. Only one population is known to include young trees of which there are only 12. All locations this tree grows in are fragmented or degraded by human activities. Furthermore the largest population exists within farmer lands putting it at risk from clearing for from being replaced by plantations. Large areas of the montane rainforests in the Guamuhaya range have already been converted into coffee plantations, and the subspecies is severely threatened by deforestation and low natural regeneration. Some protection activities have been carried out in the Alturas de Banao Ecological Reserve but further conservation is needed to keep this tree safe from extinction.